We were super excited to introduce Spirit Lake as a new venue in 2018. A beautiful 30 acre spot near Dorking, featuring two pristine lakes, woodland, manicured open spaces and a novel walled garden. Lauren and Ashley were the first to celebrate there with a festival style wedding - an absolutely brilliant day during which they used all of the unique space at this gorgeous venue and gave their guests a day to remember. Lauren had fallen in love with this stunning venue on first viewing and knew it would be the perfect spot for herself and Ashley to celebrate with their family and friends, giving them the lake-side festival wedding they were dreaming of. Placing full trust in his future wife to choose the perfect place, Ashley didn’t actually see the venue until much closer to the date, but was in total agreement that this was the one. Set up started on the Thursday morning with Surrey and Sussex Tipi Hire. The majestic peaks of the tipis could soon be seen rising into the air and the three giant hats looked wonderful down by the lower lake. Rustic tables and bench seating finished off the look, as well as the all important dance floor and stage area which would later become the platform for the band to take over the party. The day before the wedding saw all the months of hard work by this lovely couple come together as the bride and groom to be, along with friends and family, arrived on site to help add those all important finishing touches and styling items to make their wedding truly personal and unique. Fairy lights, foliage, flower posies, paper lanterns, bunting and pom-poms were strung around the inside and hung from the wooden tipi beams. The morning of the wedding dawned bright and sunny, and we were busy with final preparations; setting up the lawn games and children’s area in the walled garden; laying out hay bales by the upper lake for the ceremony; arranging flowers potted in assorted welly boots for the ceremony area; dressing the tractor trailer ready for the bride and bridesmaid to arrive in; and putting the finishing touches to the tables and the tipi dressing. Meanwhile, the Bride and Groom were free to enjoy their morning, getting themselves and their children ready for the big day. The fab team from Free Range Cooks were busy on site from early in the morning, preparing a fantastic wedding feast, but more on that later. Additional guests started to arrive mid-afternoon to join in the celebrations, as the drinks continued to flow and the laughter continued non-stop. More food was provided late afternoon by The Indian’s Next Door who served up delicious corn on the cobs, samosas, Indian wraps and bhajis, before the next round of entertainment began. A first for us, Uke-Jam had arrived to entertain the guests with Ukulele Karaoke! Yes, you heard right! 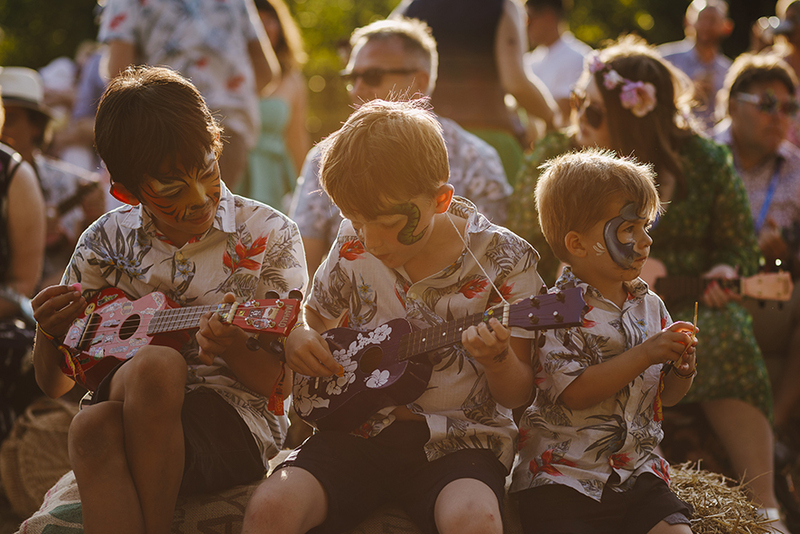 The band set up on the lawn area between the two lakes and gave out Ukuleles to the willing guests. And so another brilliant sing-along began, with Lauren and Ashley leading the way in full voice, much to the guests’ delight and applause. Once the Uke Jam was finished, Ashley and his band took centre stage to serenade his new wife and their family and friends. Après Ski, a brilliant 5-piece band including vocalists, were quick to get guests up and joining in and so followed an unforgettable evening for Lauren & Ashley of dancing and singing along with their family and friends. At midnight the music switched to a silent disco to keep the party going until the early hours, when tired but happy guests made their way to their bell tents for a good nights’ rest. Lauren and Ashley’s wedding was a beautifully personal and magical day and a resounding success. Our first wedding at Spirit Lake, it was an absolute pleasure to work with them and we wish them every happiness for the future. We asked Lauren what were her highlights of the day? And if she had any advice for couples. 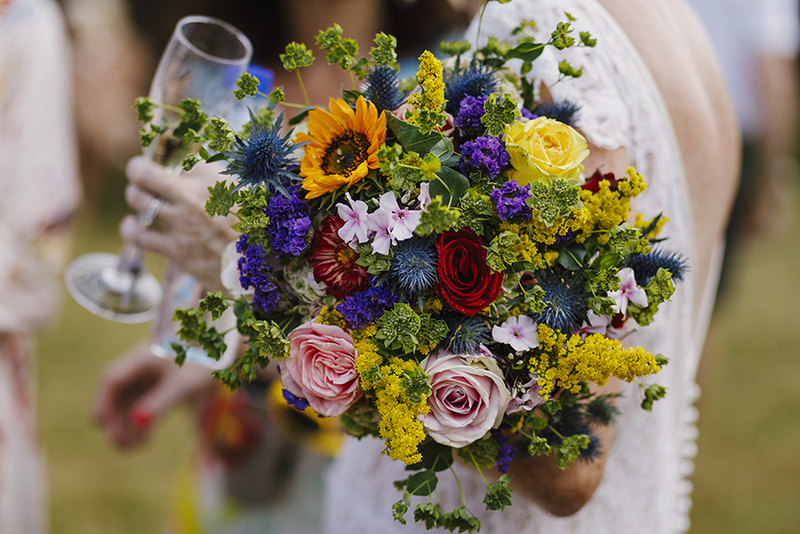 When we decided we wanted a wedding festival in a field in Surrey, the first problem was, where do you find a field to hire? We came across Festa Fields online, we met Nikki and Kim who showed me a few fields.. They were mostly booked up for the date we wanted in July when suddenly Nikki called and told me they had just got access to a new space, just outside Dorking, called Spirit Lake. Calling it a field doesn’t really do it justice, it is a beautiful garden with a woodland area to walk through, a walled garden and two beautiful lakes. It has ample space for people to glamp in bell tents or to pitch up normal tents. We had over 110 people camping over. Kim was very helpful in the run up to the event, she arranged the toilets and generator and security for the day but also suggested some great suppliers from the tipi to the bell tents. She came to help us set up on the Friday and ran the wedding day for us. Even took our baby for a walk to get her to sleep. Finally, we wanted to share a video put together by Danny Ovens (videographer and photographer) capturing the vibe beautifully.